I went to the Social Security office last week to get a new Social Security card. It's a critical part of my long-term plan to fake my own death and retire to the island haven of Mercs and Bacos. 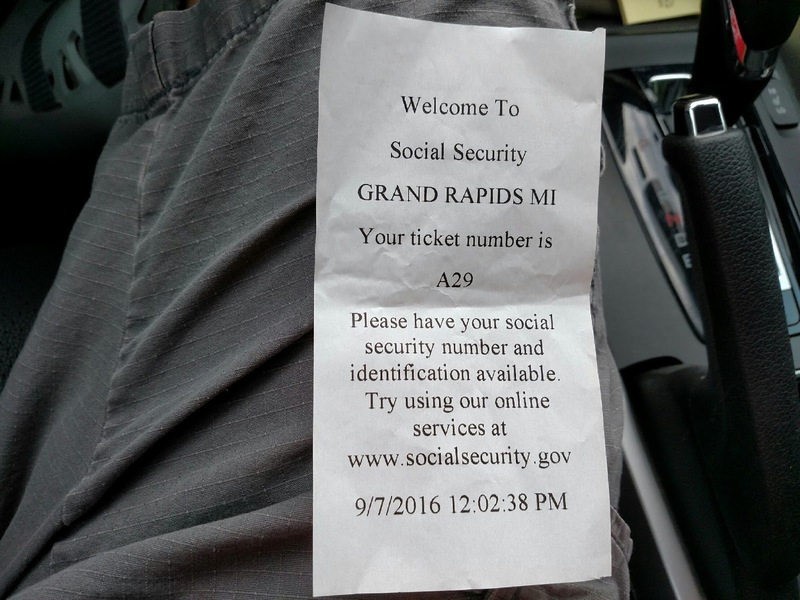 A Social Security office is a troubling melting pot of everything. If anything makes you uncomfortable, rest assured that you will find it in a Social Security Office waiting room. You see both touching and troubling things here: a young Japanese man so hip that he looked like he walked off a Matrix movie set, assisting his resolutely unhip father, who was dressed in crisp old man attire: khakis, zippered cloth jacket, baseball hat, white sneakers. I will leave out the troubling things; we have enough troubling things already. The waiting room was a civilized riot, essentially, with everyone talking at once, then everyone talking over each other, escalate and repeat. This is Michigan, though, and everyone was nice, even as the wait grew and I became at least slightly claustrophobic in a small waiting room with at least sixty other people. It was a bit nervous for me, given that I consider three people a crowd. All those people in a small space smell differently, and I am exceptionally sensitive to smells. There are even foods I quite enjoy that I never ask Gloria to cook because I can't stand the smell of their preparation. So I was very uncomfortable, through no one's fault but my own, and when they mercifully called my number, I felt a palpable sense of relief. I walked around the exit corridor of the waiting area and found my assigned window to be the very first one off the main lobby. I stepped into a different world. There was just a man sitting at a desk, dividers separating his window from invisible others, everything receding into darkness behind him. It was utterly calm; somehow, none of the noise made it around the corner. He was serene, and I wondered how the professional path from the lobby to this peaceful pocket world operated. I began to feel like this man and his small desk were floating somewhere in the darkness of space, where customers walked out of the darkness, then returned. An office of one, somewhere in the galaxy. I transacted my brief business and left, but the image stayed with me.